Top quality restaurants turn a good city into a great one. That’s why Hong Kong is a great city. 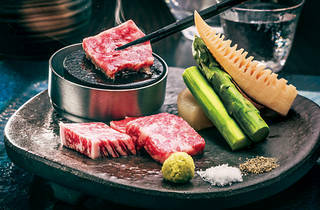 However, this creates huge competition, so to differentiate themselves, great restaurants often specialise – like the Japanese yakitori spot, the Korean barbecue haven or the French crêperie. And sometimes, the more specific the joint, the more interest it garners, due to its ‘niche cuisine’. Ebi-no-Hige is just one of these niche restaurants. The new venue serves up washoku (ingredient-focused) offerings from Niigata prefecture. For the uninitiated, this lesser-known region of Japan is famous for its Koshihikari rice. The prized grains are cooked in special copper pots and are known for their stickiness and fragrance. And, if that’s not enough, other fresh produce such as fish, burdock roots and mushrooms are also notable in Niigata. So we have high hopes for Ebi-no-Hige. Taking up the 12th floor of the Oliv building behind Times Square in Causeway Bay, Ebi-no-Hige is a simple place. Its dark interiors are framed by a high ceiling and tall glass windows, and the simple wooden furniture allows the focus to be on the food. With a plethora of natural ingredients to try, we’re told we can have the full Niigata experience if we order one of the set dinners that come in at $580, $680 and $780. We decide on the cheapest as it features highlights from Niigata and ends with the legendary Koshihikari variety of rice. We begin with a symphony of starters that includes two sushi pieces, a steamed egg with prawns, and salmon roe served alongside shaved radish. Salmon roe is usually a filler item and rarely the main attraction but the texture is crunchy and, despite being a little on the salty side, it works well with the radish. The sushi and steamed eggs are so-so. Next up – after setting our environmental sensibilities aside when we spot bluefin tuna on the menu – is fresh sashimi from Niigata. The chef’s skill clearly shines here as every piece is expertly sliced so the thickness works in harmony with the flavours of the fish. 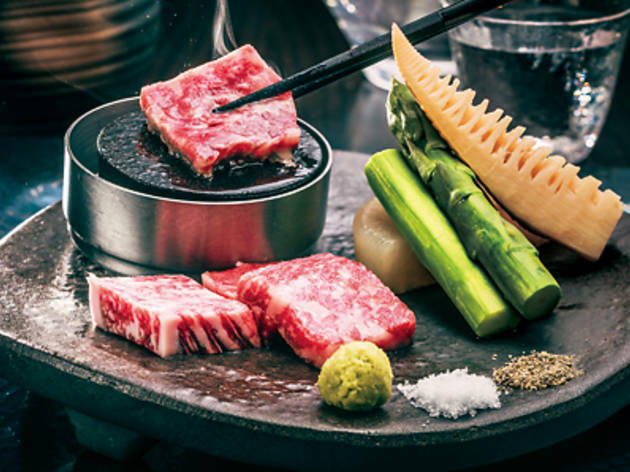 Then our wagyu dish is served raw with a super-cute palm-sized hot stone, which is used as a hot-plate of sorts, so you can cook your meat to your liking. It’s fun to sear your steak, however, the cut is good but not phenomenal. And finally – and unfortunately – the acclaimed copper pot rice also fails to hit the big time. Seeing the steaming pots bubbling away on the charcoal-fuelled ‘kamado’ stoves builds up our anticipation for this dish. But, served with a layer of sakura prawns on top, the rice is so lightly flavoured it comes across as bland. And the texture of the grain is almost mushy. A real disappointment. Ebi-no-Hige 12/F, Oliv, 15 Sharp St E, Causeway Bay, 2155 4186; ebinohige.com.hk. Dinner for two: $1,300.